This is a Leica camera that goes along with a Smart phone Apple iPhone 4. The camera, with its 12 megapixel and 8x zoom camera is an upscale and professional. 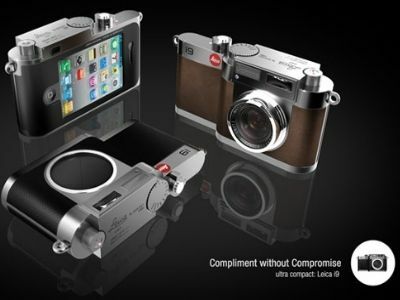 Instead of the traditional LCD digital cameras, Leica i9 has a space designed to house and connect to the iPhone 4. Technology Leica is married with options being the famous bitten apple with the Smart phone. The iPhone 4 also serves as storage for Leica i9. Although the poster is appealing, this concept has very little chance to emerge.